This entry was posted on Monday, May 31st, 2010 at 2:17 am and is filed under effect size. You can follow any responses to this entry through the RSS 2.0 feed. Both comments and pings are currently closed. 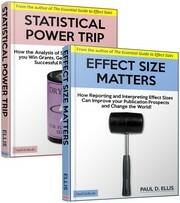 One Response to Can you give me three reasons for reporting effect sizes? Good site. A correction: p-values do not tell the direction of a result, only the probability that it or one more extreme would occur if the null hypothesis were true. The researcher armed with a confidence interval, but deprived of the false respectability of statistical significance, must work harder to convince himself and others of the importance of his findings. This can only be good.